Who invented Toilet Paper? 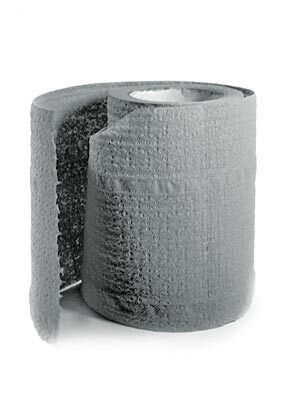 The name of the person credited with inventing of the first factory made commercial Toilet Paper is Joseph C. Gayetty (1810 - 1995). Joseph C. Gayetty is not only famous as the American inventor of Toilet Paper but also as a businessman and entrepreneur. When was Toilet Paper invented? Joseph C. Gayetty invented Toilet Paper in 1857, during the Second US Industrial Revolution / Victorian period of invention (1850 - 1914). The invention of Toilet Paper originated in America and its availability was a welcome addition to personal cleanliness and hygiene. Definition of Toilet Paper: Toilet Paper is defined as a thin, soft, lightweight, absorbent paper, usually sold in rolls around a cardboard cylinder. It is used in bathrooms for personal cleanliness and designed to deteriorate when wet in order to keep drainpipes clear. Toilet paper is available in several types of paper, textures and a variety of colors. Fact 2: Who invented Toilet Paper? The ancient Chinese invented Paper during the Ancient Chinese period known as the Han dynasty (206 BC - 220 AD) and a Chinese court official called Cai Lun (AD 48 - 121) is credited with significantly improving the existing, first form of paper and standardizing the paper-making process. Cai Lun is therefore generally credited with the invention. Fact 3: Who invented Toilet Paper? In 1391 Toilet paper was first produced in China in the Ming dynasty for the Emperor Hongwu Emperor (1368–1398). This early form of toilet paper was only for the Emperor's use. Fact 4: Who invented Toilet Paper? As time went by the use of toilet paper spread across the wealthy and upper class families of China and by the 1500's the Chinese had begun mass production of the item. Fact 5: Who invented Toilet Paper? Paper was introduced to Europe around the 12th century but was not used to any great extent until 1440 when Johannes Gutenberg invented the printing press. The 'new' material was not used as toilet paper, apart from being quite expensive at this time, there were were few sewers or plumbing networks in Europe. Fact 6: Who invented Toilet Paper? Numerous uses were found for the ancient invention, but it wasn't until 1857 that Joseph C. Gayetty invented the first factory-made Toilet Paper. Fact 7: Who invented Toilet Paper? There were primitive toilets in Medieval castles where waste was disposed of via chutes leading to the castle moat or cess pit. By the Renaissance era the vast majority of people in cities used outhouses and cess pits. Chamber pots were carelessly emptied into the streets into open sewers that ran into rivers. Fact 8: Who invented Toilet Paper? By the 19th century the River Thames London was effectively an open sewer, leading to frequent outbreaks of deadly cholera and typhoid epidemics. It wasn't until the Industrial Revolution and the later part of the 1800's that sewers and sanitation systems and the Flushing toilet were introduced to towns and cities. Fact 9: What did people use before toilet paper was invented? Cleansing aids consisted of water and primitive items such as leaves, grasses, moss, rags and sponges. Fact 10: Who invented Toilet Paper? The introduction of the flushing toilet and sewage systems led to the invention of toilet paper by Joseph C. Gayetty in 1857. Fact 11: Who invented Toilet Paper? The inventor of the first factory-made Toilet Paper, Joseph C. Gayetty, was born on 1810 in Massachusetts, United States and died on May 2, 1895. Fact 12: Who invented Toilet Paper? The early years of Joseph C. Gayetty were spent in New York where he was raised by his family. Joseph C. Gayetty received a good education and from a young age was an ambitious man. Fact 13: Who invented Toilet Paper? Joseph C. Gayetty came up with the idea of producing the first factory made commercial Toilet Paper. Convinced he was on to a winning line he established a system to to turn out mass produced items in his Gayetty Paper Company at his depot on 41 Ann Street, New York. Fact 14: Who invented Toilet Paper? Joseph C. Gayetty developed a marketing strategy and called his product "Gayetty's Medicated Paper for the water closet" and emphasized the risk of not using his product, declaring that anyone using printed papers was in danger of poisons from toxic ink papers and other "death-dealing material". His adverts for Gayetty's Medicated Paper stated it was made of pure materials and recommended for the prevention and treatment of piles (hemorrhoids). Fact 15: Who invented Toilet Paper? Joseph C. Gayetty's product was advertised as being "The Greatest Necessity of the Age" and made from pure Manila hemp paper. Joseph C. Gayetty sold his product, watermarked "J C Gayetty N Y", at 1,000 sheets for one dollar. Gayetty warned customers of imitations and to look for the watermark of the Gayetty name on each sheet and his autograph on the product label. Fact 16: Who invented Toilet Paper? Joseph C. Gayetty's product was initially viewed as a commercial failure, there were accusations that he was a quack and competitors began to marked toilet paper at cheaper prices. Fact 17: Who invented Toilet Paper? Joseph C. Gayetty died on May 2, 1895 but his product continued to be marketed by the Gayetty family until the 1920s. His name is still associated with the invention of toilet paper. Fact 18: Who invented Toilet Paper? In 1879, Walter Alcock created toilet paper on a roll, instead of using the flat sheets. Fact 19: Who invented Toilet Paper? In 1890 the roll version was introduced by the Scott Paper Company and quickly became the leading producer of Toilet Paper in the United States. Fact 20: Who invented Toilet Paper? In 1935, the first splinter free version of the product was invented by Northern Tissue. Fact 21: Who invented Toilet Paper? In 1942, St. Andrew's Paper Mill (later known as Andrex) in England began selling the first two-ply toilet paper. Fact 22: Who invented Toilet Paper? In 1943, during WW2 (1939 - 1945) novelty toilet paper was printed for the first time with images of Hitler.